Dog boarding in the Mooresville area offers a number of benefits for you and your pet while you are away. When you have to leave your dog while you go away on business or vacation, you don’t want to trust your pet to just anyone. How will you know your dog sitter is actually going to feed them and show them affection each day? Will your dog destroy your house while you’re gone? At Dogs By Andy, we offer dog boarding to keep your pet safe, encourage healthy exercise and socialization, and ensure your dog comes home healthy and happy. When your canine companion visits us for basic boarding, they will receive lots of TLC from our professional staff, as well as two meals per day and lots of opportunities for play and activity. We offer dogs staying with us a daily chew toy, daily treats, and if they have stayed for ten nights or more, a complimentary bath, if needed. You can also add amenities, depending on your dog’s personality and preferences. Dog training takes constant practice, and if you have to leave your pup but you are still working on your manners and commands, we offer a dog boarding package that will facilitate growth while you are away. If you are a previous Dogs By Andy client, we offer the complete basic dog boarding package, plus a review of obedience commands while they stay with us. Dog boarding offers a number of benefits for you and your pet while you are away. You can rest easy knowing your dog is in good hands in the Mooresville, North Carolina area. Our facility is safe and secure with 24-hour surveillance, state-of-the-art security, and a safe, fun, clean environment. Contact us today to learn more about our dog training, our facility, and how we can assist you with dog boarding. Just ask us about pricing for each of our amenities. Your dog is sure to love their boarding options with us at Dogs By Andy K-9 Services! Dogs By Andy Kennel and Training Center in Mooresville, NC was specially designed by Master Trainer Andy Hanellin with boarding rooms, separate dog training areas, a puppy play area, and indoor training rooms. Our facility is safe and secure, with 24-hour video monitoring, fire suppression and a full sprinkler system, as well as a state of the art security system. 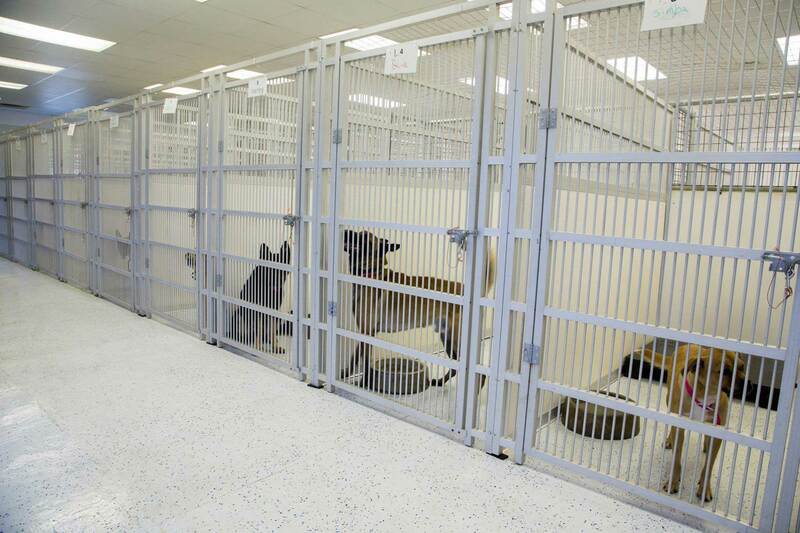 Our year-round climate controlled buildings ensure your pet stays comfortable at all times. You don’t have to stress about being away from your new pet when they stay with us for puppy boarding in the Mooresville area. Are you lost as to what to do because you need to leave your pet for a few days while you travel? You want to make sure your dog is in good hands and will be safe while you are away. At Dogs By Andy K-9 Services, we provide dog boarding for residents of Mooresville, Concord, Huntersville, Greensboro, Cornelius, Gastonia, and the Charlotte, North Carolina area, including Myers Park, Weddington, Ballantyne, and SouthPark. Our entire facility was designed by professional dog trainers to ensure a safe, fun, and clean environment for your pet so you can trust your pet with us. Curious about our facility? Take a virtual tour of our kennels at Lake Norman. Up to 2 Meals Per Day Daily TLC and Attention from our Staff Access to Indoor and Outdoor Play Areas Daily Chew Toy Daily Treats Exit Bath After 10 Consecutive Nights (at management discretion) Review Obedience Commands by Trainer FOR PREVIOUS DOGS BY ANDY CLIENTS ONLY! Dogs By Andy K-9 Services is an all-inclusive, full-service overnight canine boarding facility. Our custom-built facility was designed from the ground up to provide a safe and fun place for your pet during your travels. Dogs By Andy Kennels allows you, the pet owner, to enjoy a guilt-free vacation, knowing your dog is being cared for by trained professionals in a clean, bright, and modern facility. Read our Overnight Boarding Policies and Vaccination Requirements.